Taking delivery of a new plane is always memorable, but add to this the ability to fly further and offer a better passenger experience and you’ll understand why Sunwing executives are so excited to have two new Boeing 737 MAX 8’s in their fleet, reports assistant editor, Greg Coates in this week’s digital edition of Travel Courier. The MAX 8 is both fuel efficient and passenger-friendly. Sunwing took delivery of its first MAX 8 on May 25 from Boeing in Seattle, and the second a week later. The airline took the opportunity on its first delivery to host a group of travel industry personnel and Sunwing employees in Seattle. They were the first to fly on the new MAX 8 as it flew a non-revenue flight from Seattle to Toronto. The two Boeing 737 MAX 8 aircraft – identifiable by their split tip wingtips – are part of a lease agreement concluded with Air Lease Corporation in late 2014 – a $350 million deal that will see four more of the aircraft delivered by May 2019. “The 737 MAX 8 aircraft is an integral part of Sunwing’s overall expansion plans across an increasing number of both Canadian and US gateways and illustrates the evolution of the company. We’re really excited. This is a big deal for us,” said Mark Williams, president of Sunwing Airlines. 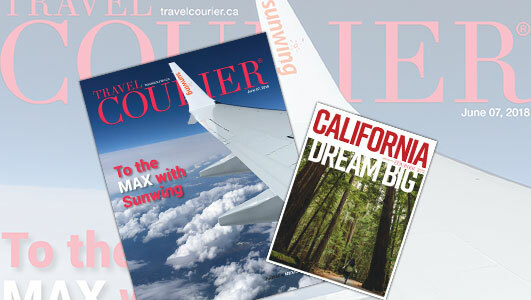 Plus this week’s Travel Courier features a special California supplement — so don’t miss it!